Home › dieselgate › Did Volkswagen mislead owners into believing the emissions fix was mandatory? We’ve been covering the Volkswagen Groups emissions fix closely over the last few months and have been paying attention to the feedback on our website and social media accounts. With the EGR issues aside we’re concerned that owners had been unsure about their choice (or lack of it) when it came to having the so called “technical measures” applied in the first place. 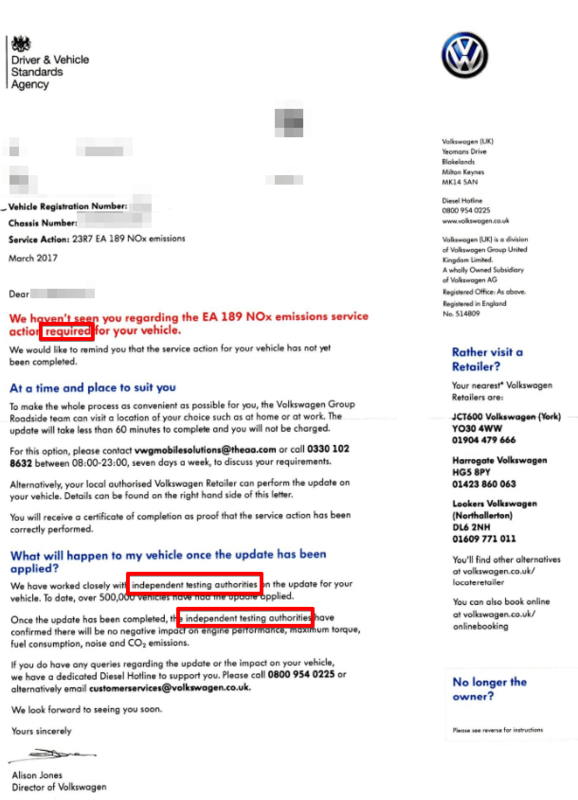 Being a diesel Skoda owner myself, I quizzed my local dealership on a recent visit (Wings Skoda Peterborough Feb 2017) about the emissions fix “etiquette”, only to be told that any updates require specific authorisation by the owner. Being that my Skoda is Euro6 compliant, I’ve been lucky enough not to have had my car recalled however we’re aware that a significant number of owners felt they had been pressured and mislead into having the “technical measures” applied. In all cases (we are aware of) they claim to that the letters suggested that the fix was a mandatory requirement for their vehicle. In addition the result of your car’s MOT will not be affected by the NOx emissions issue, whether your car receives the technical measures or not and there is no reason why your car insurance would be affected by this NOx emissions issue. With the above in mind its quite clear that VW accept that some owners will not choose to have the technical measures applied but make no attempt to say in black and white that the fix is “optional”. We’ve reviewed the many letters (signed by no less than Paul Willis) that owners have supplied us (thank you) and we’re a little concerned that this optional fix seems quite the opposite on paper. There is certainly no mention of that MOTs will not be affected – fix or not. The letters go a little something like this. As you can see from the array of letters kindly submitted by owners, they make no effort to explain that the fix is optional and will not affect the vehicle’s roadworthiness or ability to pass an MOT. You’ll also note our highlighting of the word required (in red) and the numerous confirmations that the technical measures have been approved for UK use. We’re also unsure about the need for a certificate of completion for this “optional” fix. 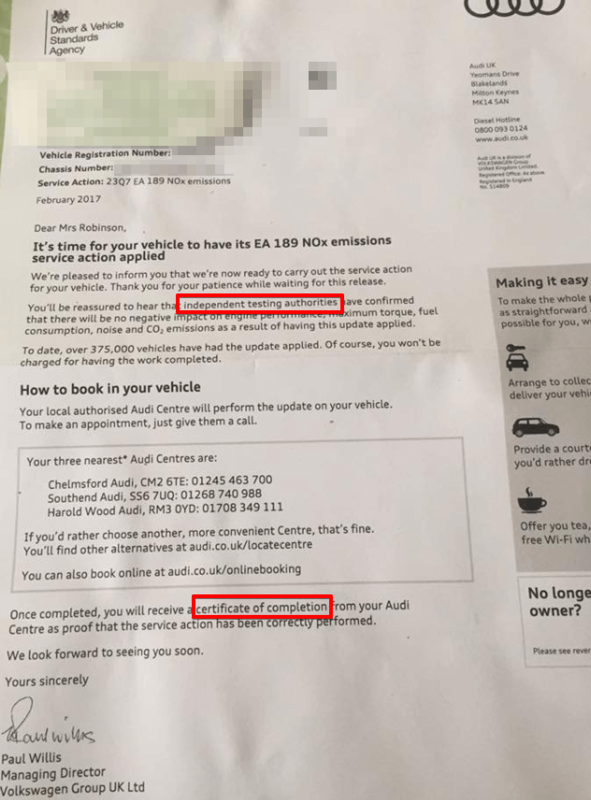 We’ve been made aware that some owners have been contacted multiple times and in one case have had no less than 10 letters from VW reminding them about the emissions fix. Its also been claimed that dealerships have been calling owners of affected vehicles to arrange a bookings. Why is the Driver & Vehicle Standards Agency logo on the letters? Further cause for concern is the very official Driver & Vehicle Standards Agency logo which appears on every letter sent out. This might lead to believe that the fix has been independently tested by the DVSA, you’d be wrong about that too. The technical measures have been authorised by Germany’s Federal Motor Transport Authority (KBA) however no official testing or authorisation has been given by any UK body (that we are aware of). To someone unaware of VW’s FAQ, it would seem (to me at least) that the fix is not optional and the recall is both required and approved by the Driver & Vehicle Standards Agency. We’ve reached out to owners for their thoughts on the matter and here’s what they said. Is someone from VW listening? 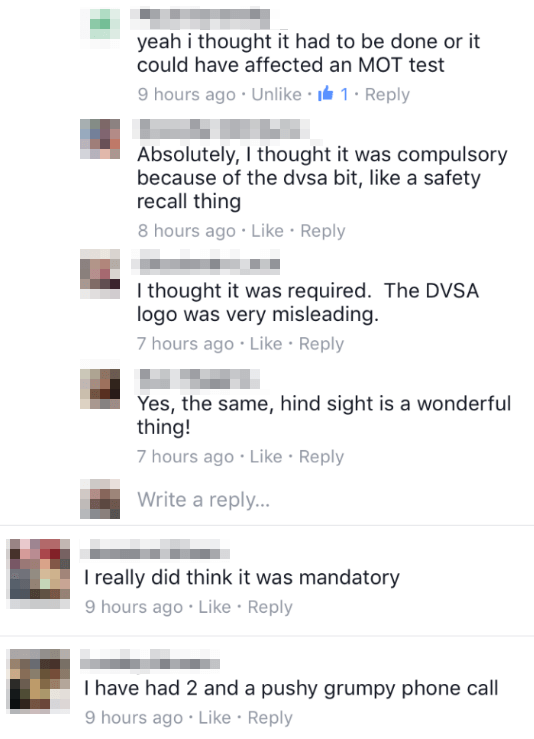 If the technical measures were not tested or required by the Driver & Vehicle Standards Agency why was their logo present on the letters? Was any attempt made by VW to substantiate the claim that the fix had been independently tested and approved in the UK? Why was it not made clear in the letters that quote: The NOx emissions issue does not change the fact that your car remains safe and roadworthy. There is no evidence to suggest that the affected EA189 diesel engine vehicles present a risk to health or safety as a result of the NOx emissions issue. If this fix was in fact optional then why was the update described as “required”? Can you please explain why VW customers in the US have been offered comprehensive warranties and replacement EGR valves and DPF filters as part of the fix. We’re more than willing to publish VW’s answers to the above in an unbiased way. Please do get in touch Mr Willis. Have you had the emissions fix applied to your vehicle? Did you feel pressured into it? Was the fix applied without your consent? Let us know in the comments. Please give details of the dealership if you can. Sorry to hear that Martha. It seems that many others are in the same boat as you. VW’s lack of clarity with the update was a very poor move indeed. We understand that many owners have lost trust in the brand after the farce. You’re not alone in your reported issues also, how VW can claim that the update did not cause any adverse affects is simply a lie. Good article. I’ve been following this issue carefully from the beginning. It appears that just about everything has been worded to encourage drivers to apply the fix, whilst nothing has been said about what the effect will be in the real world. It seems like all the tests they refer to are in laboritory conditions. And isn’t that what got us all into this mess in the first place? This hasn’t just damaged my trust in VAG. I now don’t trust a word that any expert tells me. This is deeply worrying. You’re absolutely right. I personally don’t think you’ll see the entire fallout from these issues until the long term issues start to arise such as mass DPF failures. Real world figures just don’t seem to matter anymore. With new EU recommendations being pushed through expect the auto industry as a whole to be revealed as the devious, lying criminals they are. I have had 10 -20% reduction in fuel economy since the mod. VW say they won’t reverse the mod. Can I get the engine re chipped privately to put it back to how it was? Thats just what i asked them today on the phone . i would bill them fully for the job of re-mapping also .no answer from them just asked me to re-book the car in again . We thought the fix was mandatory, never thought to question it al all……what a mistake! I was certainly under the impression that if the emissions were not fixed the it would result in a M O T failure. The Tiguan went in two weeks ago I had the fan running after after even short runs I timed it 4-5 minutes.To day on dash display the symbol fault in exhaust system go to workshop .At 47000 I had New injectors and fuel pump ,at 51000 A new common rail. Worst car with regard to reliability and expense I have ever owned. Had the ’emissions service’ a few weeks ago. I also assumed it was a requirement. I have since noticed the engine fan staying on after switch off. Not something it has done before the ‘fix’. I have also noticed that when running from cold the engine appears to misfire for the first few miles then settles down. A bit disconcerting when I need to exit a junction quickly. Anyone else noticed this happening. Great information by the way! There are thousands in the same boat as you. The way VW approached this is criminal. The fans staying on indicate that the car attempted a DPF regeneration and was unable to finish it. The EGR changes in the fix cause the DPF to clog up at least twice as fast. The “misfire” you hear is the engine running lean – its diesel knock. Just another byproduct of them reducing the fueling in a vain attempt to curb the NOX emissions. If you get a chance could you fill in our survey – – we’re nearly at the magic 500! Make sure your get the car back into the dealer and open a case with customer care. I completely agree. 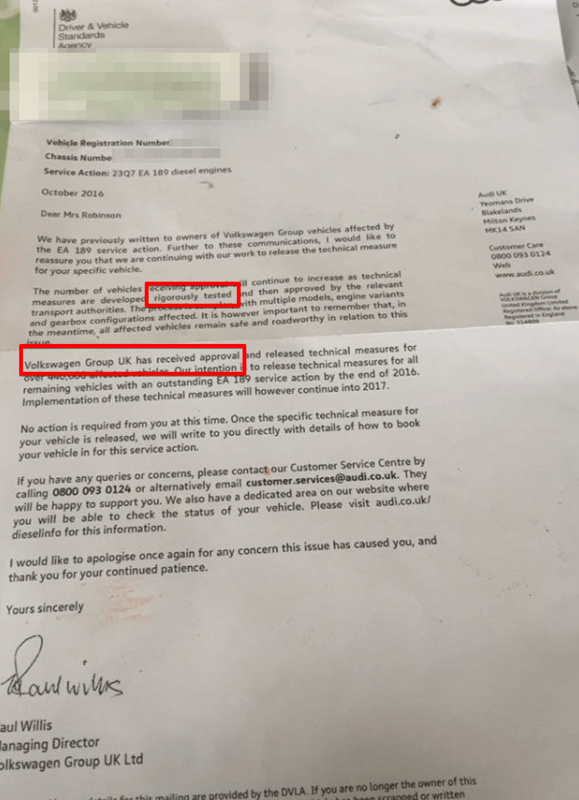 Whilst I was sceptical of the fix, my wife (who drives the 2011 VW Golf which needs the fix) felt compelled to drop the car at our local garage due to how the letter was worded, and had the DVSA logo on it. A few months later, the Emissions Control light/ Engine management lamp came on. The problem was due to a soot build up in the EGR pipes, and I was scoffed when I asked the VW Arnold Clark Dealership (Crow Road, Glasgow) this could be related to the fix. I just feel let down with the VAG brand. The car sounds like a tractor, and has less torque since the fix..
You’re in the same boat as many others unfortunately. VW mislead all of their customers and ripped them off in the process. Speak to VW customer care and ask them to look into it. Many owners are getting a full “good will” fix for these type of issues. Thats shocking , i was thinking that because the DVSA Logo was on the letter that it was a fix that had to be done ,after my fix ( sorry to call it that ) i was given a list of items that needed to be addressed like break pads etc , got it check at my local garage who said that only one of the items on the list of 8 was in need of doing , so i see the Vw garage using even this as an opportunity to cash in on us poor owners . I’ve had two letters so far both carrying the DVSA logo, neither state that the update is optional and the latter with red text I assume to infer urgency or a warning. I had my 2.0 Tiguan R booked in to have the update applied at my local dealer but after speaking to both VW customer service and the dealer for assurances that they would guarantee repairing the EGR or any other subsequent issues FOC, neither were prepared to offer this so I have cancelled my booking and won’t be having the EA189 update applied anytime soon. I think the way they have treated customers is shocking and will never buy another VW. From day one I have NO intentions of allowing of VW to make any alterations to my car, currently (Just passed MOT) with NO advisories!!!!!! it is averaging 56mpg, you can hardly hear the engine even from initial Cold Start up its that quiet & drives like the wind with its 187bhp. I have also contacted the Lawers that are on offer on the Web Site, so will keep you posted. Tried to book my Skoda in yesterday with garage to have emissions service. Asked them to come and collect it and they said that they were not in a position to do this. The letter from Skoda says they will make this as easy as possible for the customer and that you can opt to have the garage come and collect from you. I live 10 miles away. But having seen comments on this site and others, I’m not sure that I want to take the risk of having the job done anyway. Consider the issues many people have experienced. I for one would not have it done. 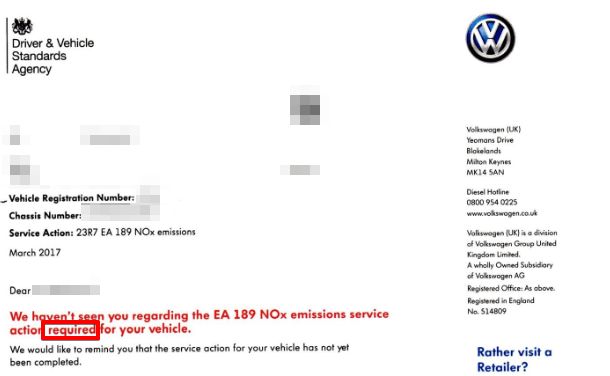 I have a 2009 VW EOS which had the EA 189 NOx service action completed late April, in June the car just died. It was if the ignition had been switched off and it would not restart. Had it taken to the local VW dealership who had performed the E189 service action, pointing out on numerous occasions that the car had not had any problems prior to the service action, the car has only done 22,000 miles. After testing and having been passed onto a different customer service representative 4 times, I was eventually advised that they have detected a lack of compression in three of the four cylinders, and to investigate further would would be a cost to me with the possibility of needing a replacement reconditioned engine costing approximately £7K. They told me that the car had no scrap value to them. Lodged a complaint with VW Diesel Helpline, still waiting for them to get back to me. Just come across this forum. I have a 2014 VW cc with the 2 litre diesel and DSG box. Mileage is 32000. My engine seems to “diesel knock” occasionally and the cooling fan runs a lot regardless of the time the engine has run. I have had a letter from VW saying that the relevant approval authorities have approved the technical measures and confirmed that there is no effect on noise amongst other things. It goes on to say that any failure reported to them will be carefully considered and that they will act swiftly to respond to customers’ concerns. This remains to be seen. I had our Audi A3 1.6 to audi for the fix, the letter was vague and felt optional but went ahead and got it done. When they completed the work they then given me.a letter saying all vehicles that have the work done beyond 160,000 miles will not be considered in event of a EGR failure. I didn’t think much of it as I signed it before I understood it and the dealer did not explain the document I had to sign. Our audi has done 161,000 miles 2010 1.6 tdi sport back. Does that mean I have been screwed? I have a 2.0 TD Passat, 2008 model, and had the fix applied because I thought it was probably mandatory, but if not, it would be the “right” thing to do. I then had the engine fan run on problem, and was told that was normal by the garage. Then a month ago the engine emissions light came on. The car went in for 2 days, and they ended up changing the inlet manifold. Luckily, they said that this could be oue to the VW fix, and if it was, VW would pay. That turned out to be the case, and I didn’t pay anything. My car has done 114,000 miles – I hadn’t heard of a 160,000 limit before. My concern is does the fix lead to continued ongoing problems?